Melbourne is the coastal capital of the south-eastern Australian state of Victoria and is often known as Australia’s Coffee Capital. 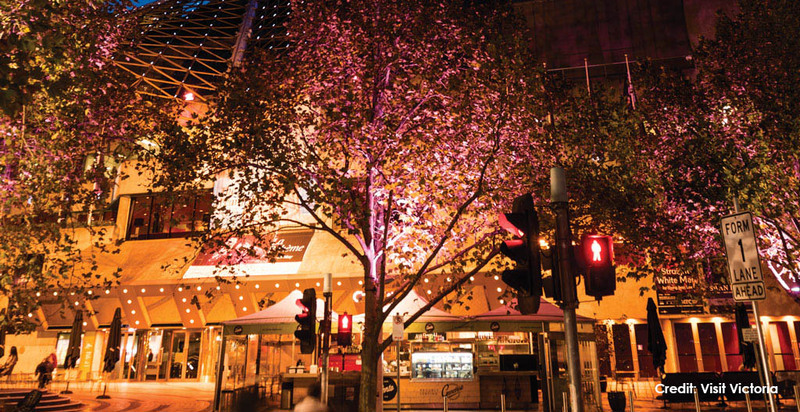 Most visitors base themselves in the city centre, the buzzing commercial heart of Melbourne that’s also home to museums, theatres, restaurants, bars and shops. Melbourne’s grid layout makes it an easy city to navigate, with most attractions within walking distance. Transport options include train, tram, bus or bike. At the city’s centre is the modern Federation Square development, with plazas, bars, and restaurants by the Yarra River. In the Southbank area, the Melbourne Arts Precinct is the site of Arts Centre Melbourne – a performing arts complex – and the National Gallery of Victoria, with Australian and indigenous art. Melbourne’s exciting mix of style, sport, and culture and dining means you’ll never want to leave. So you think the koalas are cute – just wait until you see the Little Penguins. After visiting the information centre, you’ll head down to Summerland Beach to witness penguin magic. As the sun sets, the wild Little Penguins emerge from the sea after a hard days fishing and waddle across the sand to their dune burrows. These Little Penguins are the smallest of the penguin species and Phillip Island is home to the largest colony in the world. It’s easy to understand why this wonderful spectacle is one of Australia’s most popular wildlife attractions. To protect these Little Penguins, all revenue generated from the parade is invested into environment and education projects. Sovereign Hill, a wonderful outdoor museum exhibiting in ‘real life’ the story of Australia’s gold rush history.